Provide comfort for the family of George Thurber with a meaningful gesture of sympathy. George Frederick Thurber, known as Geof to his friends and family, passed away in the early hours of Monday morning, Feb 5th, at the age of 63 of an apparent heart attack. He is survived by his wife Beth Tierney, his children Ella and James Thurber, his father Davis P. Thurber, stepmother Patricia Thurber, his sister Shellburne Thurber, brothers Steven and Matthew Thurber, stepsisters Michelle Earnest and Kathy Davis and many much-loved nieces, nephews, cousins, sisters and brothers-in-law. Geof was pre-deceased by his mother Shirley Amos Thurber and his stepbrother Charles Martin Skillas. Geof was born in Boston, MA in 1955 and grew up in Nashua, NH. He attended New York University and Sarah Lawrence College before moving to Detroit, Michigan, where he played bass in Jett Black, a Phoenix, Arizona band affiliated with Alice Cooper. After two years, the group moved to LA, where Geof, a skilled bass player and teacher, continued to work as a session musician before finally settling in Boston. He performed in several Boston area bands during the hey-day of the 1980’s club scene. In 1989, Geof joined fellow musician Greg McCleary’s Heart Punch Studio, Inc., which quickly evolved from a music recording studio into a highly successful audio post production house for broadcast, television and independent film. 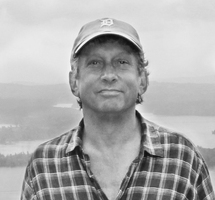 Over the ensuing years, Geof became a partner in the business and worked on sound design for over 200 broadcasts, such as Nova, American Masters, American Experience, and Independent Lens, and for many independent films, including Brad Anderson’s break-through film Next Stop Wonderland. Geof and Greg were nominated for an Emmy in 2006 and won the Best Sound festival prize at the Jackson Hole Wildlife Film Festival in 2007. Geof loved the outdoors, especially New Hampshire’s lakes region. He shared his life long reverence for Squam Lake by boating friends and family for hours across its stretches and channels. With his wife and family, he shared his home in Newton for countless dinners and get-togethers. Geof was the gentle heart of our family. He lived for his wife and his children who were, without doubt, his proudest accomplishment. They were his greatest joy and what gave his life the most meaning. Their many adventures traveling together were filled with wonder and will live in their memories forever. He was infinitely kind and unfailingly generous. He will be sorely missed. Visiting hours will be from 2 PM to 5 PM on Sunday, February 10th at the United Parish of Auburndale, 64 Hancock Street, Newton, MA. A service and celebration of Geof’s life will be Monday, February 11th at 2 PM, also at the United Parish of Auburndale. In lieu of flowers, donations in Geof’s name can be made to Camp Hale, a summer camp for underprivileged kids from Boston, located on Geof’s beloved Squam Lake. To plant a memorial tree in honor of George Franklin "Geof" Thurber, please visit our Heartfelt Sympathies Store. Please accept my sincere condolences for your loss. When someone you love dies, you often find some measure of comfort in the memories you have. Something else that can bring comfort is the knowledge that you are not alone in your remembrance of them. John 5:28, 29: “Do not be amazed at this, for the hour is coming in which all those in the memorial tombs will hear his voice and come out...” The term “memorial tombs” as used in this verse carries the implication of preserving the memory of the one who has died. In this context it suggests that the person who died is remembered by God. So overtime you may feel that you are the only one who remembers your loved one, but God has not forgotten then. His memory is not ravaged by time, and he will use his memory to restore life to those who have fallen asleep in death. May this knowledge bring you comfort during this difficult time.